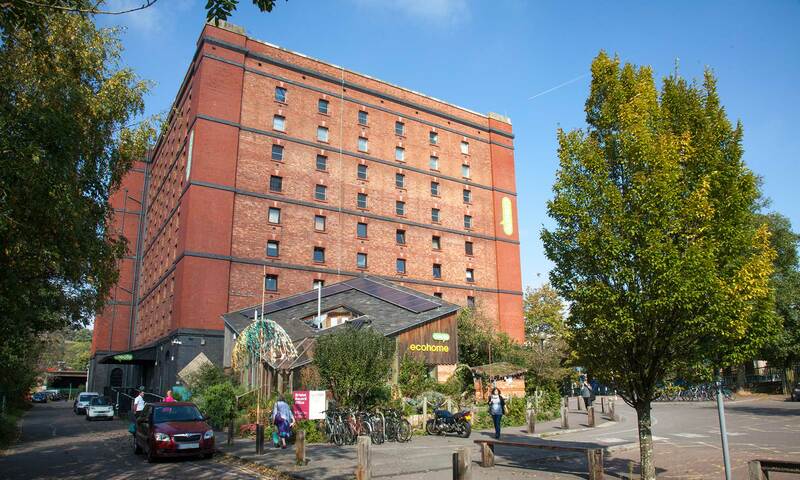 The Create Centre is in one of the three large red brick warehouses in Cumberland Basin, halfway between Clifton Suspension Bridge and the ss Great Britain. The city centre is only 1.8 miles away – a pleasant 30-minute walk along the docks. Temple Meads railway station is about 2 miles and Broadmead bus station 2.5 miles. From the city centre the Festival Way cycle track runs alongside Cumberland Road (riverside) to Create and on to Long Ashton. From Bedminster the cycle track crosses Greville Smyth park, crossing the old railway bridge and on to Create. and over the old rail bridge and on to Create. Plenty of cycle parking is provided inside and outside the building, and showers and lockers are available for visitors. Visit www.betterbybike.info for bike route maps and to read about their fantastic loan bike scheme. Yobikes are now available around Bristol from £1 a ride. Download the app to find your nearest bike. The m2 serves Long Ashton Park & Ride, Ashton Vale, Ashton Gate, Cumberland Basin, Spike Island, Redcliff Hill, Temple Meads, Cabot Circus and Broadmead. The 505 Wessex Connect bus stops at Merchants Road, Hotwells. This service runs from Southmead to Bower Ashton via Redland, Clifton and Hotwells. the city centre along Hotwells Road, stopping just before Junction Lock Bridge, marked by the red dot above. Buses that stop here are the 71, 505, 903, Portway Park & Ride, X1 all the way through to X9, including X3A, and X54. Temple Meads railway station, serviced by trains from across the country, is situated around two miles from Create. You can also hire a Brompton folding bike from Temple Meads Station. Available 24/7 from fully automated docks. For more information please visit Brompton Bike Hire. Bristol Ferry Boat Company runs reliable timetabled ferries to and from the Create Centre (Nova Scotia landing stage on Hotwells ferry). 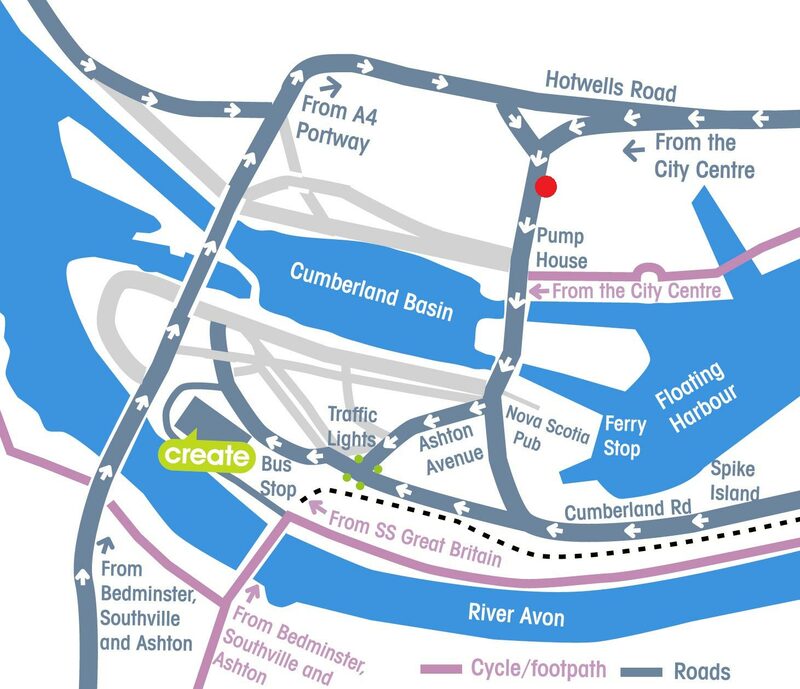 Catch the ferry direct to Create from any of their designated landing stages, including Temple Meads Station, City Centre and the ss Great Britain. For more details on their route and timetable click here. There is very limited permit parking* at the Create Centre as well as 3 hour Pay and Display. As an environment centre we positively encourage other forms of transport. If you must come by car, please allow plenty of time to park as you may have to park within a five minute walk of the centre. The car park immediately adjacent to Create includes 5 accessible bays; a ‘blue’ badge must be displayed when using these and your badge will act as your permit. Car park maps can be sent out on request. *Visitors to the Create Centre and Bristol Archives can acquire a parking permit from Create reception after finding a space. The permit is to be displayed on the dashboard of the vehicle so that it is visible. Vehicle registrations are needed for permits to be issued.